A year ago Stephanie Jonsson and I were selected by curator Katie Brennan of the Lake Country Public Art Gallery to participate in a two-person show. Katie felt there was a "synergy" between our work. "Through the Strange, new essences, creating the world anew" has been showing since October 8th. 2014 and ends this Saturday, November 15th. 2014. Click here to see images, slideshows and videos of our show. I wanted to introduce you to Stephanie and her sculptures. 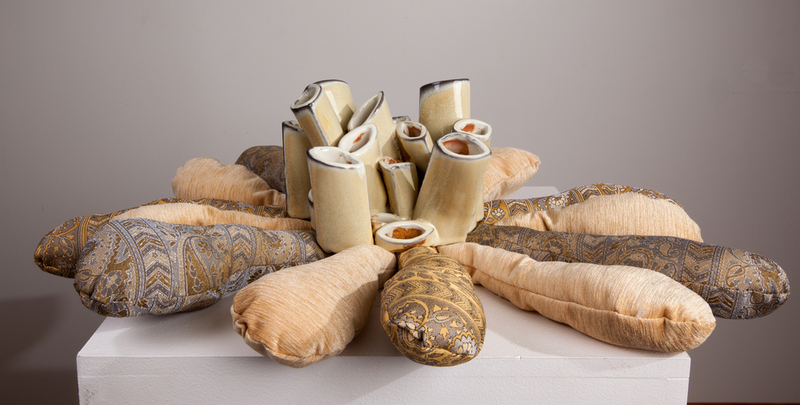 Since graduating from the University of Alberta in 2005 with a Bachelor of Fine Arts with a major in sculpture, Stephanie’s practice has grown to include ceramics and textiles, both mediums that she was not formally trained in. 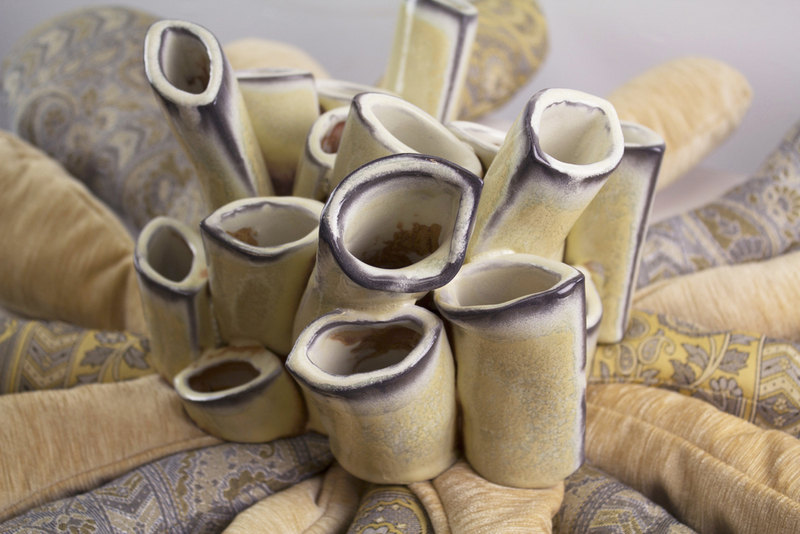 Since graduating from the University of Alberta in 2005 with a Bachelor of Fine Arts with a major in sculpture, Stephanie’s practice has grown to include glazes and fabrics, both mediums that she was not formally trained in. In 2007/2008, Stephanie did a yearlong residency at Harcourt House Gallery in Edmonton, AB and was nominated for the Emerging Artist of the Year for the Mayor’s Evening of the Arts Awards in Edmonton. In September 2009, Stephanie completed a two-month residency at the Banff Centre for the Arts in Banff, AB. During 2009 she received the Award of Achievement from the Alberta Craft Council for outstanding efforts in ceramics, and was listed among Avenue Magazine’s “Top 40 Under 40” in Edmonton. 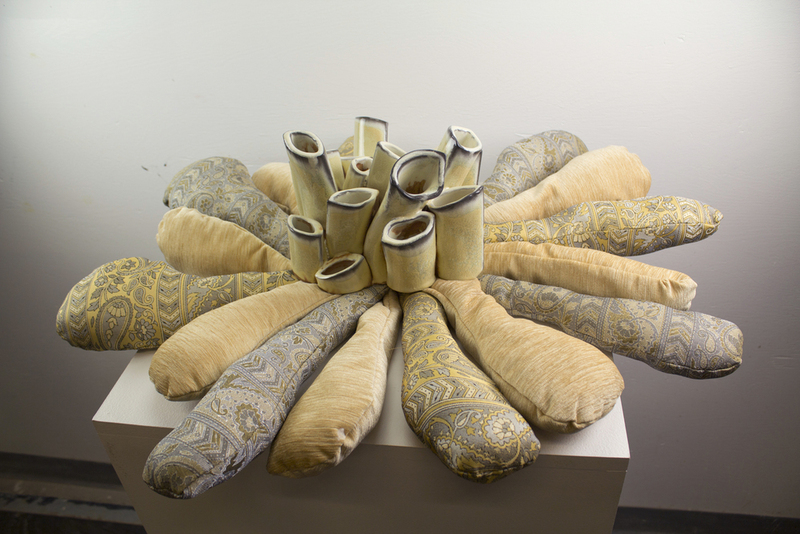 In 2012 Stephanie completed her Master of Applied Arts degree at Emily Carr University in Vancouver, BC. Stephanie has taught art at various organizations in Edmonton, including the Art Gallery of Alberta, the Nina Haggerty Centre for the Arts, and Harcourt House Centre. She has taught art to all ages of elementary and secondary school, as well as adult classes and classes for developmentally disabled adults. In 2013/2014, Stephanie taught all levels of undergraduate ceramics at Kwantlen Polytechnic University in Surrey, BC. She is currently doing a year-long residency at Medalta in Medicine Hat, AB. Of personal interest to me is the common usage of botanical subjects in abstract and stylized form to decorate the surfaces of Arts and Crafts metalwork, ceramic, textiles, glass, and furniture. 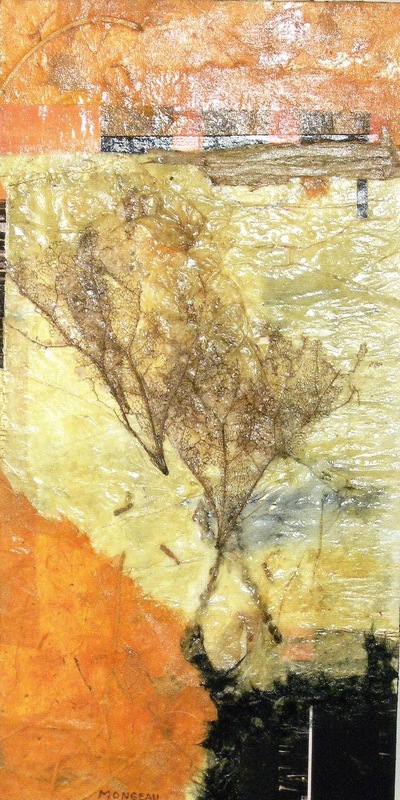 In response to John Ruskin's ideas these artists returned to the observation of nature in their work, and the phenomenon of appropriating nature, which started in the 19th century and continues into the present day. However, over time, architects, designers, and artists have started to look less to nature as a source, and more to a synthetic nature. During the early nineteenth century, designers were not interested in capturing a naturalistic representation of a tendril from a plant, rather they were searching for a form that spoke to a universal plant. Victorian architects used the practice of conventionalization as a stylization of the leaf ornament, so asymmetry in the veins of a leaf would be abandoned in favour of symmetrical cutouts. This reduction or stylization of the plant form in order to confirm to anthropocentric systems of order is precisely the type of appropriation in which I am interested. I find that the stylization of plants in the work of this period has re-emerged in a contemporary context and it is appearing in everything from interior design to website, furniture, and clothing design. Humans have continued to appropriate and manufacture nature. I am particularly interested in the way that nature has been commodified as consumable imagery, and how the repetition of this imagery has become kitsch. 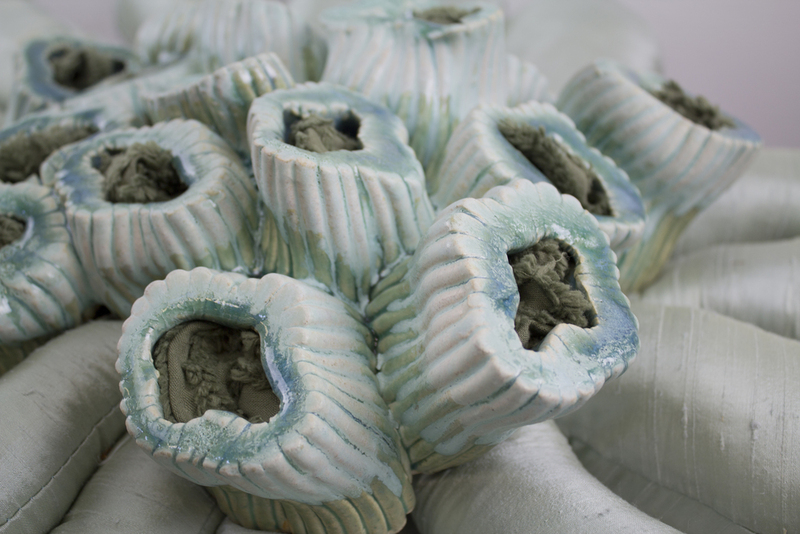 For this new body of work, I used mostly extruded ceramic forms to produce multiples to create a sort of facsimile of nature. Each repeated element is unique and flawed, yet somehow self-similar. 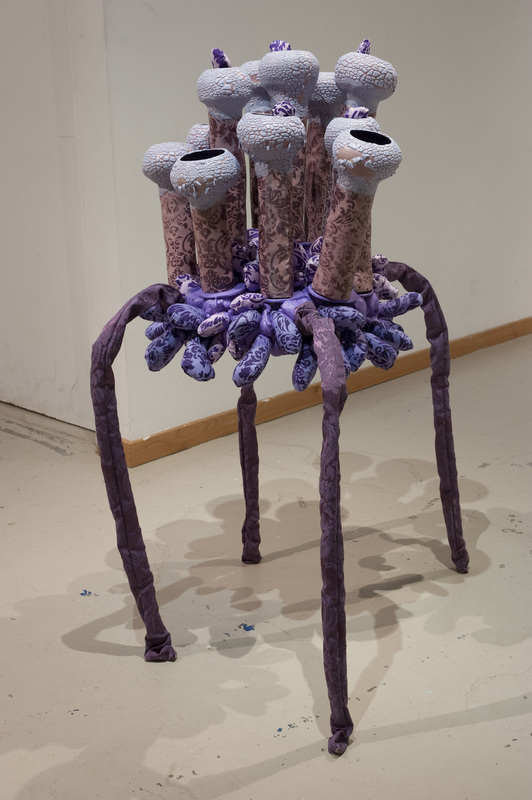 I use abstraction loosely: these sculptures do not accurately depict real world animals or plants, however, they merely make associations with creatures, specifically underwater ones. The objects stay true to a sort of manufactured ecology: these sculptures are clearly made with techniques that are a product of culture, not nature. 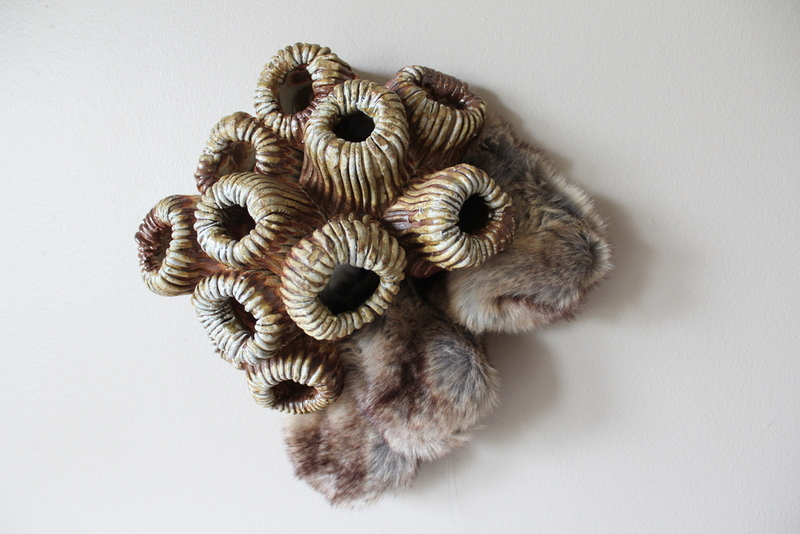 In the piece, “Urban Urchins”, I found consumer objects that imitate natural forms and slip cast them to produce multiples, transforming them into a type of kitsch that is twice removed from nature: a facsimile of a facsimile of nature. In this case, I found a replica of a sea urchin and cast it twenty five times. 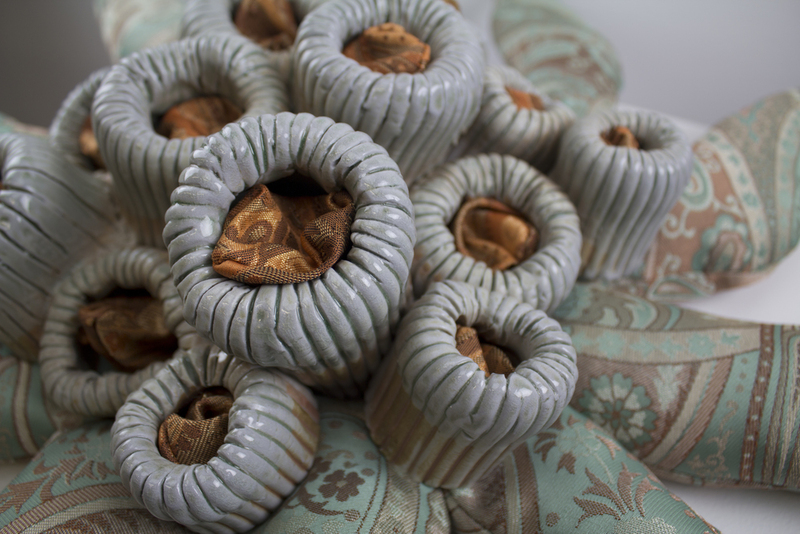 Through the process of slip casting, the forms become mutated and distorted from their original form. This is not unlike the process of evolution in nature, which requires self-replicating entities with tiny errors to sample other configurations. New genes can be generated from an ancestral gene when a duplicate copy mutates and acquires a new function. The generation of new genes can also involve small parts of several genes being duplicated, with these fragments then recombining to form new combinations with new functions. In “Urban Urchins”, the mutations of slip casting mimic the tiny “copy errors” in the process of evolution, and a whole new organism is created. 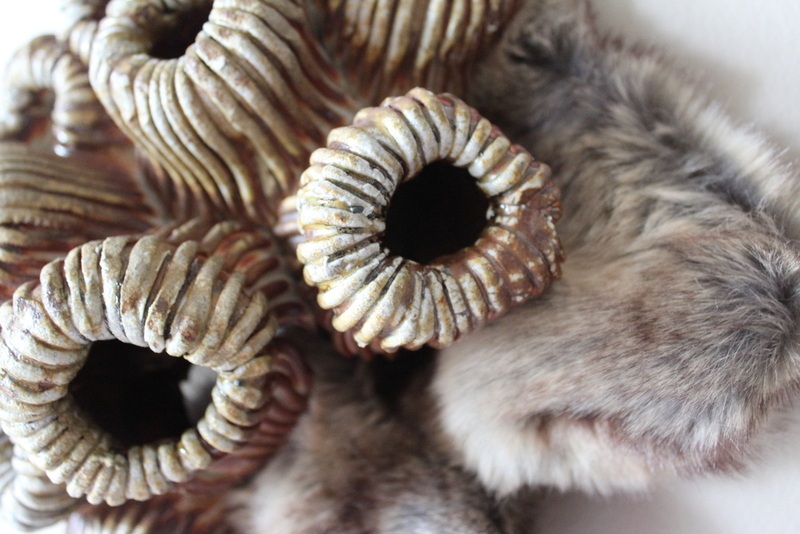 The organism that is created in my work is an artificial object that imitates nature and its processes. I am not attempting to convey a solution to the multitude of problems that our environment faces, but rather to call attention to this curious cultural trend in hopes that a greater awareness will emerge on an individual level. Through reiterating natural forms; deconstructing and reassembling organic order, I am addressing a collective estrangement from our origins. Be sure to check out Stephanie Jonsson's website and blog for more information and images of her work. Set against the dramatic cliffs of the South Saskatchewan River in Medicine Hat, Alberta, the 150 acre Historic Clay District was once home to some of Canada’s most important clay factories, including Medalta Potteries, Hycroft China, National Porcelain and Alberta Clay Products. Today, this history is being preserved with the unique Medalta Potteries site providing the setting for a living, working museum, vibrant education centre, a Reception Gallery, and a 12,000 square foot contemporary ceramics studio, The Shaw International Centre for Contemporary Ceramics. Operating out of the Shaw Centre, the Medalta International Artists in Residence Program is designed to serve artists at all stages of their careers. Students, emerging, and established artists are able to work together in our open, spacious, semi-private studios. The studio experience is one of cooperation and creativity. Artists come from all over the world and bring different experiences, techniques and ideas to our unique studios here in the Historic Clay District. Our studios are full of vibrant energy with resident ceramic artists, community education classes, workshops, and kids’ classes all combining to make this a vital working museum, education centre and studio complex. "Connection", "Becoming" and "Grow into You" (the painting below) are part of a series of 15 paintings that I created for the upcoming group show "Proof of Identification". Information on the show is in the August 25th entry. Over the years I have created a lexicon of symbols that have special meaning to me that I use as metaphors for my personal visual language. These "identifiers": chrysalis, butterfly, seed-pod, ladder, honeycomb, ruler, ABC, 123, spiral, double helix, cells...for example work together with chosen themes. 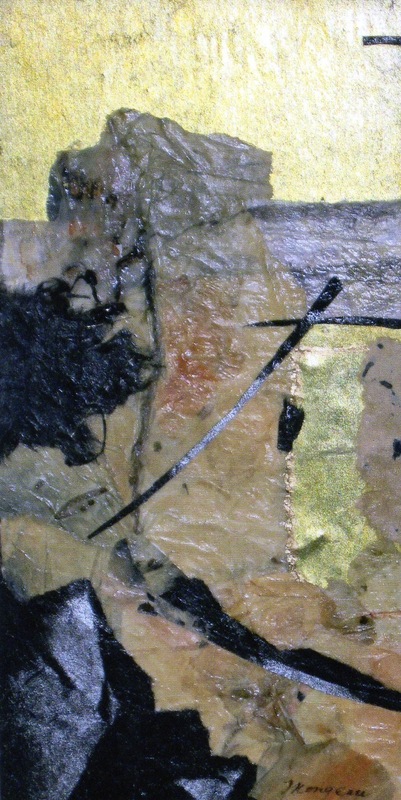 These combined ideas and images in turn inform my mark making and direct the "look and feel" of the piece. This is an intuitive process with painting multiple layers of marks, text, shapes, line and colour. I am interested in themes of life, death and rebirth; transformation and metamorphosis; the ancient and the primordial. 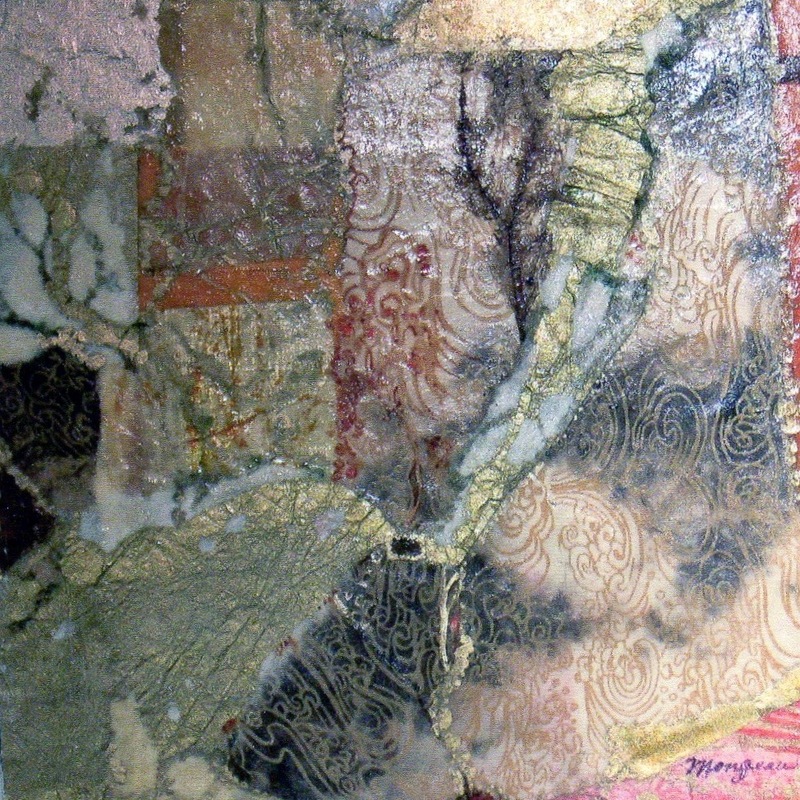 My abstract paintings are created by applying a rich layering process of mixed media, acrylic paint, collage, drawing, stamping, scratching, subtracting...combined with a layering of imagination, intuition, metaphor, memories, dreams and symbols. Check out the new photo album "Proof Of Identification" in the left margin to see all 15 paintings. New Work by Kirsten Brand at "The Gallery at the MAC"
Kirsten is a good friend of mine who is having an upcoming art show; here is the information on her show followedby her artist statement. I am a Victoria born painter and have been studying and producing art since early childhood. I believe nature has a natural harmony. The beauty, profusion and growth rhythms of flowers and plant life create a visual music for me. I use bold colour and floral and plant forms to convey the vitality, energy, and movement of the life force. The human figure appears in some of my work to symbolize our infinite love and fascination for, as well as dependence upon botanical life. 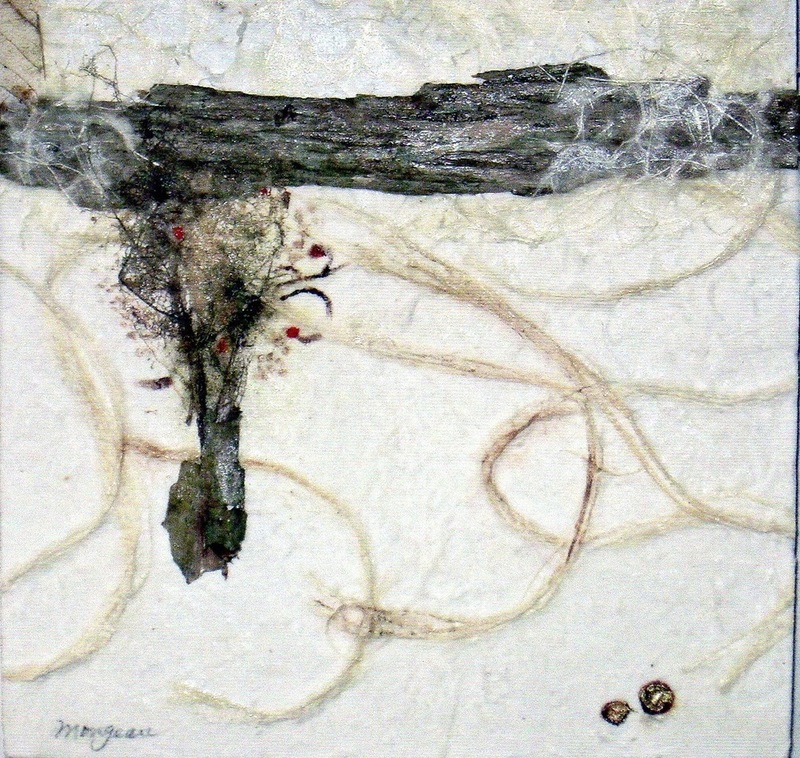 In my current work I take real pieces of nature in the form of dried, pressed, plants from their outdoor landscapes where a chaos of texture, colour, and pattern reign supreme, and place them in an abstract setting of painterly texture, colour, and pattern. I am intrigued by the play between something real and abstract both working together to create a work. The idea of "regeneration" applies because I would like the viewer to see nature again and in a different way, connecting physically – hence the texture – giving them a sense of feeling the touch of the surface in order to heighten awareness and joy about what is given us. 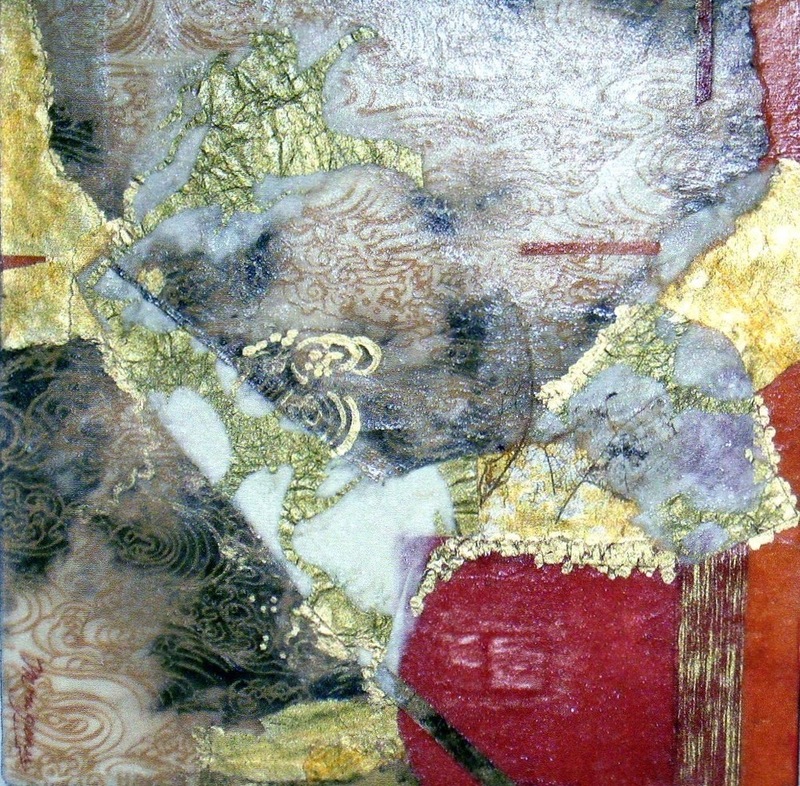 Mary Stewart is a member of the Federation of Canadian Artists - several months ago she received Associate (AFCA) Status. This status is achieved through a selective process of those Active members consistently having demonstrated superior ability in the General Members' Exhibitions and through other jury criteria. Mary describes this painting: "Houses and their symbolic parts have appeared in my artwork since our purchase of a 1918 Craftsman style house in need of restoration. My husband recently replaced the entire elctrical system and as his "apprentice" I became familiar with some of the terminology. "60 cylces per second" is the standard frequency (hertz) for household elecrtrical current in North America. 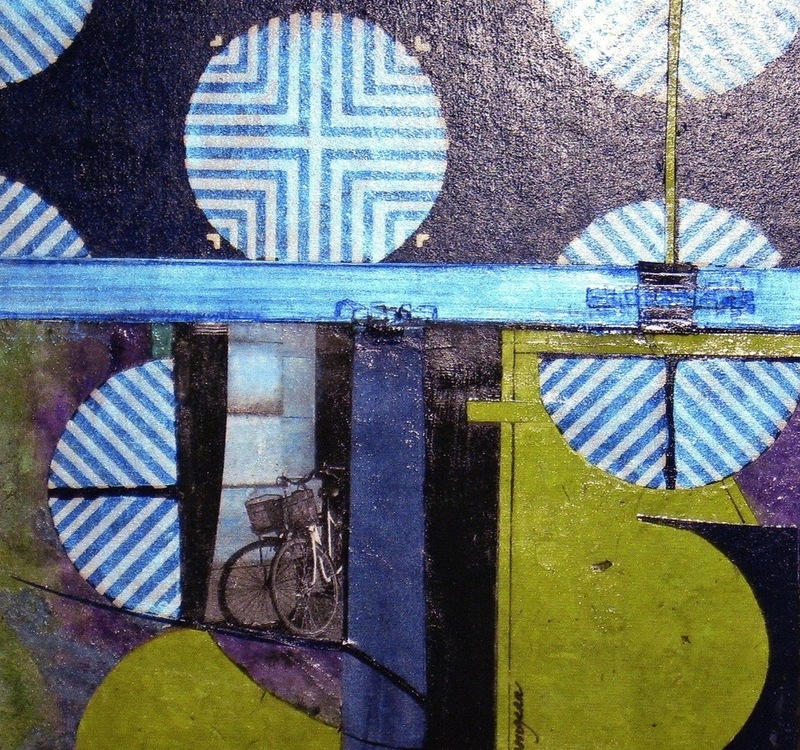 My painting is a collaged mixed media piece that started with old schematic drawings and an electrical template. The warm oranges and reds represent the heat genereated by electicity. 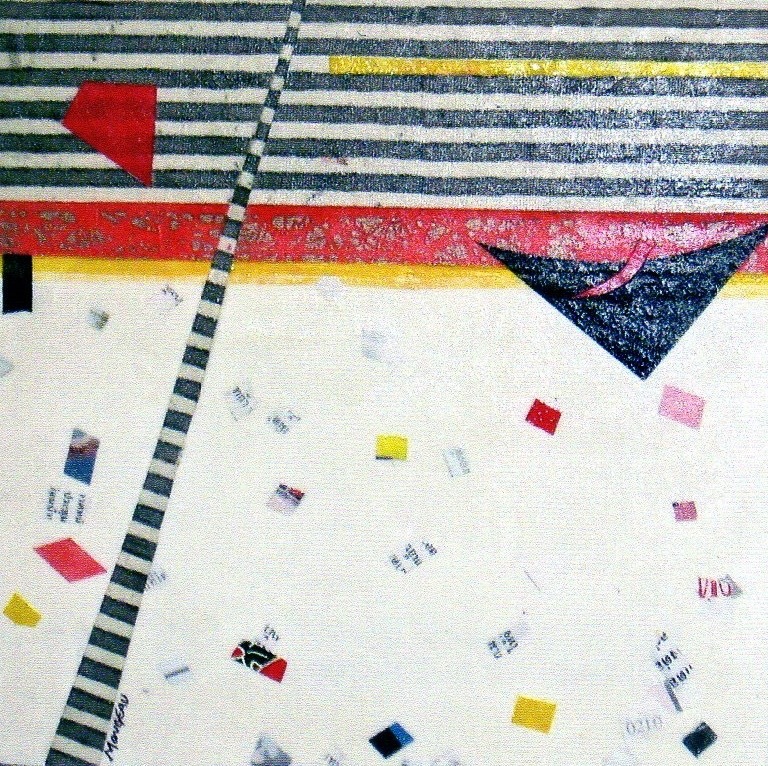 Their placement on the cool coloured background causes the viewer's eye to "cycle" around the canvas." More of Mary's work can be seen in the Summer 2007 show also shown at the Federation Gallery. Mary also operates "Vancouver Island Workshops" in Nanaimo, BC. Over the past several years Mary has brought to Nanaimo many well known artists from Canada and the United States to teach 5-day workshops. I have attended several of these workshops with artists such as Gerald Brommer, Carole Barnes, Betsy Dillard Stroud, Ann Zelinksi, Suzanne Northcott, Jane Pederson and Carolyn Houg. In the spring of 2009 Mary has Pat Dews teaching a 5-day workshop. Mary is a brilliant workshop organizer who creates a wonderful atmosphere that is comfortable for both teacher and student. She works tirelessly to produce a workshop experience that the student can relax in and enjoy every moment. Mary's behind the scenes work takes care of every detail, right down to a never ending supply of coffee, tea and snacks, such as the famous cheese ball, veggies and decadent desserts offered thoughout the day. Thank you Mary for all the hard work that you do. Creative Catalyst Productions produces the highest quality art instruction videos for many skill levels in a variety of mediums. I own several of these DVD's and I have found them to be a first class product and they are very informative . The most recent one that I purchased is by Carla O'Connor. "Carlahas worked extensively with all media, from oil to pastel, but eventually found her love in gouache. She believes every medium is capable of saying something different. Gouache was the one that finally spoke truest to her. With gouache Carla creates shapes (she's a self described "shape maker"), using the human form as her guide. As an artist, Carla focuses on design. Many of her workshops focus on incorporating design principles into students' work. Carla's art world extends far beyond her canvas. She has become a much sought-after workshop instructor and has taught all over the world. She has served on juries for prestigious national and international exhibitions, including shows for the American Watercolor Society, the National Watercolor Society, and the Adirondacks International Exhibition of American Watercolors." I had the opportunity to take a workshop with Carla about 5 years ago - she is a fabulous and gifted teacher. Carla is well organized and I got a week packed with information that was worth its weight in gold. Click: Miro at MoMAto see the online exhibition - this is a super presentation and teaching tool, once you click on the first painting in each series click again on the explore icon, you hear the voice of the curator and conservator describing and explaining the meaning and techique behind each series. You can zoom in on each piece and many have a written description of the process. Very interesting. THe Museum of Modern Art states: "This is the first major museum exhibition to identify the core practices and strategies Miró used to attack and reinvigorate painting between 1927 and 1937, a transformative decade within his long career. Taking his notorious claim—“I want to assassinate painting” —as its point of departure, the exhibition explores twelve of Miró’s sustained series from this decade, beginning with a 1927 group of works on canvas that appears to be raw and concluding with 1937’s singular, hallucinatory painting, Still Life with Old Shoe. Acidic color, grotesque disfigurement, purposeful stylistic heterogeneity, and the use of collage and readymade materials are among the aggressive tactics that Miró used in pursuit of his goal. By assembling in unprecedented depth the interrelated series of paintings, collages, objects, and drawings of this decade, this exhibition repeatedly poses the question of what painting meant to Miró and what he proposed as its opposite, and in the process reveals the artist’s paradoxical nature: an artist of violence and resistance who never ceased to be a painter, a creator of forms. A fully illustrated catalogue accompanies the exhibition". "Aeris 5" - Jylian Gustlin 48' X 48"
Check out this website for information on the artist and a vast portfolio of paintings and drawings. Click on her name for the link. Polly Hammet has a wonderul section on monoprints on her wondeful website. Check them out. "The present is continuously passing away & yet it is always here". This painting of Diane's is part of a group show in Houston, Texas. 10+ is a Houston based artists' group that has been gathering monthly for over 12 years "to share our lives, objectively review our art work & support each other on our artistic journeys. This past year we agreed to read Tolle's book, A New Earth, and to use it as a point of departure for creating individual visual responses to a portion of the book that especially resonated with each one of us. This show, "Present", is the result of our introspection and reaction. Each diverse creation, using color, line & design, holds its own conclusions & truths. Displayed here together, the works acknowledge our collective instinct to connect with one other consciously & respectfully". 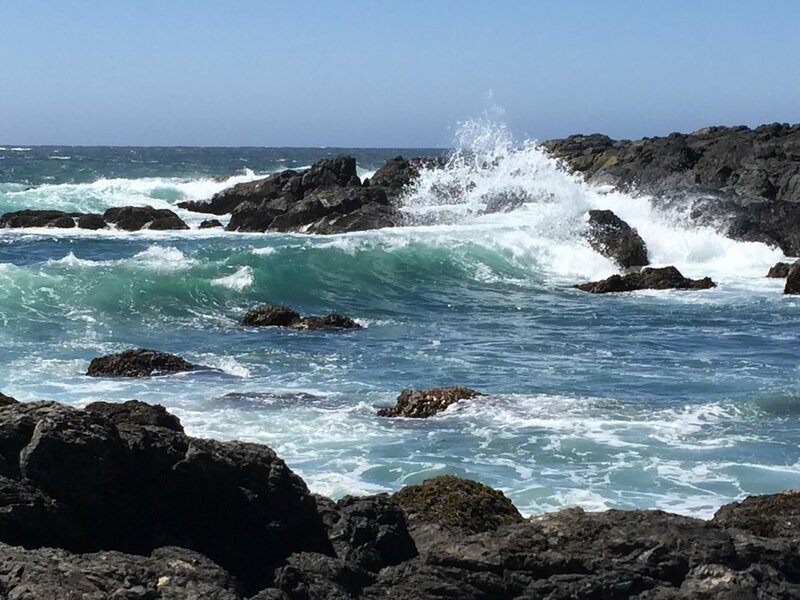 An artist/graphic designer living on Central Oregon Coast. Obsessed with markers, pens, inks, paper, patterns, good design, wallpaper, cacti, vintage fabric, empty journals and anything little.